These days there seem to be more big events, tours, races and auctions than ever before. Cars are going ever further over the top, the crowds keep growing, and the action never seems to end. While these events can offer a lot of fun and reward, they’re sometimes overwhelming and complicated. What do you do when you just want to go for a drive and celebrate the car hobby? Our favorite answer is the garage tour. We’ve organized many of them using a straightforward mantra: Keep it simple. These tours have two primary goals: see other people’s garages (and their projects) and get some seat time in a fun car. 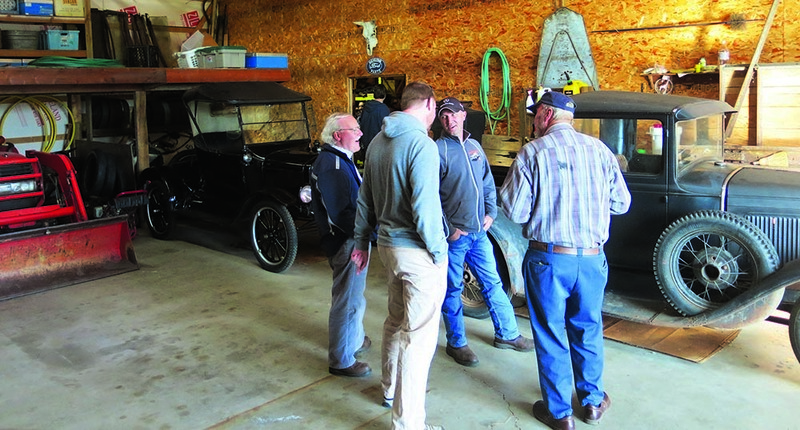 We generally set aside a Saturday afternoon, put three garages on the tour, and invite 10 to 15 people and about half as many cars. Along with our goals, we have two rules: Nobody cleans up, and only fun cars drive on the tour. Of course, if someone doesn’t have a fun car available, we put them in the passenger seat of someone else’s or loan them something. We generally pick garages that are fairly close to each other, but still offer everyone a chance to rack up about 30 to 40 miles over the course of the afternoon. We ask the garage owners to be ready to discuss some of their favorite tools, cars or wall hangings. We usually keep refreshments out of the equation to eliminate pomp and circumstance, and we welcome new friends–and garages–whenever we get a chance. We love to mix themes and styles on our tours. Our last tour included a shop filled with European cars, one with an early-Ford theme, and another containing fairly modern stage rally cars–with space left over for a garage band. Tour participants loved seeing things they weren’t used to seeing, and everyone learned something. We like to schedule these tours at the beginning or end of the driving season. They provide a great way to motivate each other to get our cars prepped for upcoming use, and let us celebrate something we’ve done with our own projects–whether it’s a fresh restoration or just a good detail and sorting job. We usually spend about an hour at each garage and caravan together to the next one. We pick routes that are scenic and slow so that we can enjoy all the cars as well as our own. These tours aren’t about being impressive; they’re about having a good time. A one-stall shed can be as much fun as a full-blown professional shop, especially if it’s got some creativity invested in it. We like to put every kind of garage on our tours so that they can provide inspiration to every budget. Our significant others may come along, although many times they don’t. Sometimes we’ll turn the last stop into a small party with snacks, pizza or maybe a cookout. That usually brings out the family and makes the whole day into a great social affair. A problem we’ve found is that tour groups grow too large over time. We try to bring new garages into each tour, and with each new garage comes more participants. We find it a bit difficult to accommodate more than 20 people; not only does the organization need to be tighter–remember, we want our tours to be grassroots in nature–but we also grow concerned about the privacy of the garage owners and their neighbors. One fix is to encourage the tour groups to split and start splinter tours. Another fix is to keep the planning absolutely last-minute–we often plan a Saturday tour just a couple of days in advance. If you’re looking for some relaxed fun between your next few events, consider getting a group of friends together to go look at each others’ garages. You can rack up a few miles in some fun cars, it doesn’t require much planning or effort, but it should still deliver a fun, memorable outing. Want to learn how to build your own garage? Check out our DIY home shop build series.